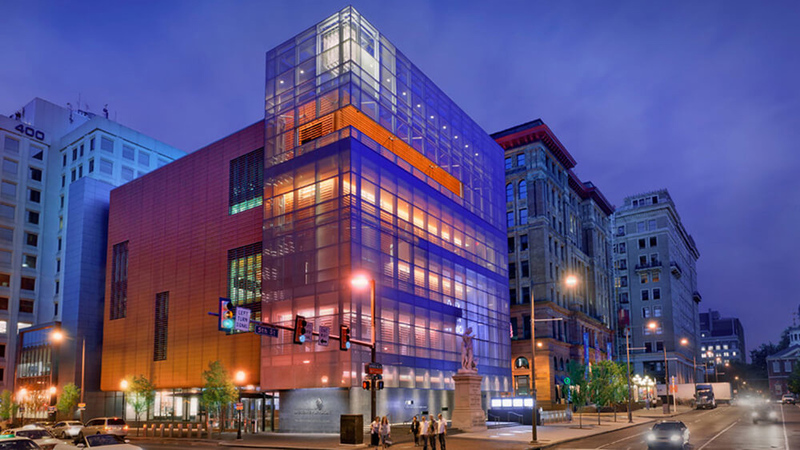 “The stories of American Jews are woven into the rich history of this diverse nation,” says Ivy Barsky, CEO and Gwen Goodman Director of the National Museum of American Jewish History, the lead sponsor of JAHM. “By celebrating JAHM, we honor the values of inclusion, acceptance, and religious pluralism cherished by this country. Award-winning author and illustrator Ezra Jack Keats (1916 – 1983), whose children’s books include Whistle for Willie, Peter’s Chair, and The Snowy Day, was the son Eastern European Jewish immigrants and very poor. Growing up in East New York, Keats’ experience of antisemitism and poverty in his youth gave him a lifelong sympathy for others who suffered prejudice and want. His work transcends the personal and reflects the universal concerns of children. The Snowy Day featured the first African American protagonist in a full color picture book. The Snowy Day and the Art of Ezra Jack Keats was on view at NMAJH in 2013. The exhibition was organized by The Jewish Museum, New York, from the collection of the de Grummond Children’s Literature Collection, The University of Southern Mississippi. Bernard Waber (1921 – 2013) brought us stories such as A Lion Named Shirley Williamson, Ira Sleeps Over, Do You See a Mouse?, and Courage, which explore children’s issues while his fables and satires crafted deceptively simple tales that reward readers with their nutshell wisdom. Like Keats, he was the son of Eastern European immigrants. Waber grew up in an observant Jewish home and considered Jewishness central to his identity. Lyle Lyle, Crocodile and Friends: The Art of Bernard Waber was on view at NMAJH in 2015. This exhibition was organized by The Eric Carle Museum of Picture Book Art, Amherst, Massachusetts. Stan Lee (1922 – 2018), though not an illustrator himself, gave the world Spiderman, Incredible Hulk, Iron Man, among other legendary Marvel Comic superheroes. In the DC Comics universe, characters like Superman, created by Jerry Siegel (1914 – 1996) and Joe Shuster (1914 – 1992), has clear Jewish roots, and whose character further developed as WWII unfolded. Rube Goldberg (1883 – 1970), the subject of recent NMAJH special exhibition, The Art of Rube Goldberg, is one of the most influential and prolific cartoon illustrators of the twentieth century who is best known for his whimsical invention drawing cartoons, and also won a Pulitzer Prize for his political cartoon about the Atom Bomb. Roz Chast, The New Yorker cartoonist and author of Can’t We Talk About Something More Pleasant?, Leela Corman, who’s graphic novel Unterzakhn follows the lives of Jewish twin sisters growing up in the tenements of New York City’s Lower East Side, and underground comics movement artist Diana Noomin, best known for her character DiDi Glitz, who addresses transgressive social issues, are just a few of the industry’s leading women today. Maira Kalman, best known for her exuberant The New Yorker covers and children’s books, is the daughter of Sara Berman, a Jewish immigrant who left her marriage of nearly 40 years and her life in Israel for New York. Opening on April 5, NMAJH will present special exhibition Sara Berman’s Closet. The installation, re-created by Maira and her son Alex Kalman, will feature the Museum’s first-ever public art installation on the Kimmel Plaza, on the corner of 5th and Market Streets in Philadelphia, and an accompanying exhibition with new paintings by Maira. Visitors to the JAHM website, jahm.us, can find ways to celebrate JAHM in their own communities. The JAHM website offers interactive content and educational resources to facilitate nationwide engagement, including a toolkit for promoting awareness in individual communities. Teachers, students, and lifelong learners can peruse lesson plans and reading lists. All are encouraged to submit their JAHM-related events to the website’s calendar, whether it is an exhibition, concert, gallery talk, film screening, lecture, or other program that connects to the theme, by visiting jahm.us/events. This year’s theme will be further explored in a forthcoming booklet produced by the National Museum of American Jewish History, which will also be available as a digital download on the website. Beyond this year’s theme, visitors to the website can explore American Jewish stories from different states, and explore previous JAHM themes and resources on American Jews and Music, Jewish medical pioneers, and American Jews in Education. For more information and developing JAHM news and special events, visit www.jahm.us.